On the tenth floor of 387 Park Avenue South there were two office cultures existing side by side. If you went left out of the reception area you reached the sales, promotion and subscription departments. If you went right you walked toward the bullpen, editorial offices and the mailroom. But the gulf between the two sides was wider than just an office building floor. A lot of us in the bullpen didn’t know that much about what went on over there. But we knew this… they went home earlier than we did. All of them. Heck, we had so much fun working together in the bullpen that we hardly wanted it to end. We would often go out after work in a group for dinners or activities. That was a great bunch and one of the most wonderful times of my life. When we got the guns we played around a bit in the bullpen, but couldn’t get too serious around the staffers who were still working. Bullets, even rubber ones, and ink don’t mix. But there was that lovely dark, deserted area on the other side of the tenth floor. Sometimes we had teams, sometimes we picked a guy to be “it.” One night it was Squid’s turn. John (Squid)(Jack) Morelli was athletic, nimble, fast, tough and fearless. An amateur body builder from the mean streets of Brooklyn. Squid used to jump down onto the subway tracks and run across three or four sets of rails to change trains! Sometimes with transit cops in hot pursuit! In the 30 second head start we gave him he managed to clamber (silently) up a six foot high file cabinet and hide in the tiny space between the top of the file and the soffit. Hidden in a dark nook amongst the notebooks and boxes of paper where we never imagined anyone could fit, much less climb into, he picked off all his hunters until we cried uncle. Little rubber bullets littered the area, but I don’t think even one came near him. We turned on the lights and told him to come out, looking around to solve the mystery of where he had hidden. When he crawled out and jumped down off that file cabinet it broke everybody up. But just like all gateway drugs, those toy guns led to harder stuff. I don’t remember who first suggested this new thing… paintball. But it sounded like it might be cool. 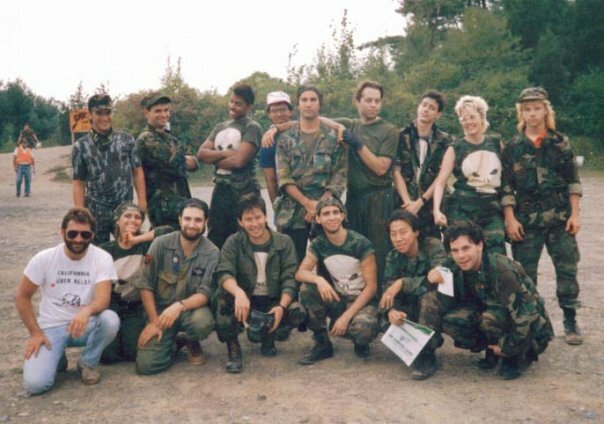 An initial foray was organized to a paintball field upstate to a place near Newburgh and early one Saturday morning a small group of us met outside the Marvel offices. It was so early that some of the Park Avenue hookers were still out. They were scary in the daylight. 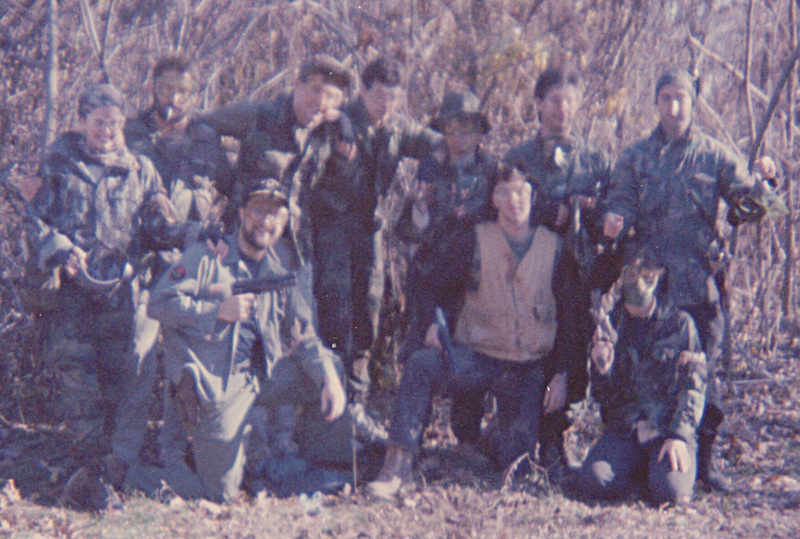 For that first time, we didn’t have all of our camo clothing and masks and we rented guns at the field. I remember feeling really intimidated by the other, more experienced players who made fun of us (and were kind of jerks) but in the very first game we did really well! We caught on quick and had a blast. It was a lot of fun and we knew we needed more. The only bad part was being grouped on a team with those jerks, and the obvious solution was to organize a large enough fighting force to have a team of our own. Thus the Marvel Punishers were born. After that it was an addiction. Carl Potts did a great job organizing a lot of things with Steve Buccellato and Hector Collazo, I think. I remember Carl, John Wellington, myself and a couple of others bought our own paintball guns, a really good one at the time, the Carter Comp gun. We had special camo t-shirts printed up with a big Punisher skull that Carl drew (Carl, I still have it!). The t-shirts were cool-looking, but turned out to make a really good target for the other side to hit. So, we had some less prominent embroidered patches made. Front row: Bob Sharen, Cynthia Martin, Dan Raspler, Carl Potts, Hector Collazo, Michael Yee, Dave Wohl. 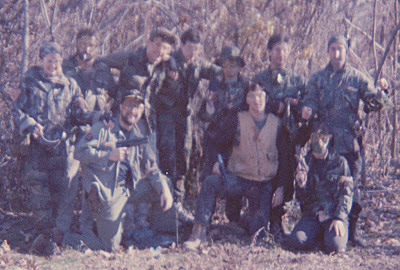 We even went in for Airsoft guns that shot hard little plastic bullets and went out to Phil Felix’s farm in western New Jersey to practice with them. Those things hurt when they hit you. And I accidentally shot Morrelli in a very tender spot. I still feel bad about it. But see, paintballs break up when you shoot into brush. So I shot at a figure crouching behind some underbrush, not thinking that the darn little projectile would pass right through it. But it was the best time I can remember. We really were at our best when playing with all our own guys. I think everyone honestly liked one another. 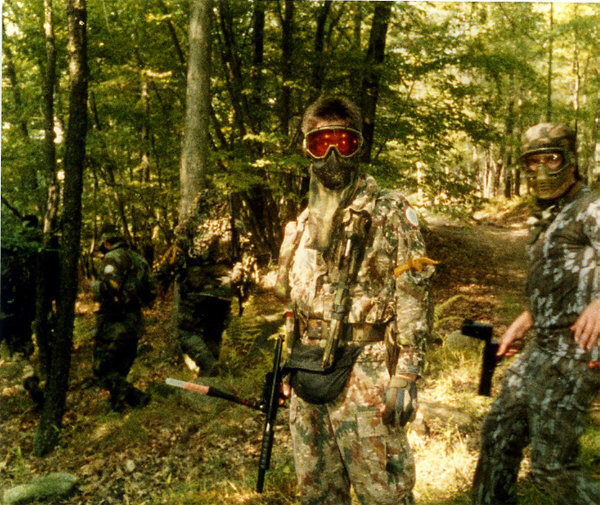 We went on one weekend paintball trip to a place in Pennsylvania called Wolf’s Lair. That was an extensive paintball field with different types of fields to play in including a village and a kind of castle. 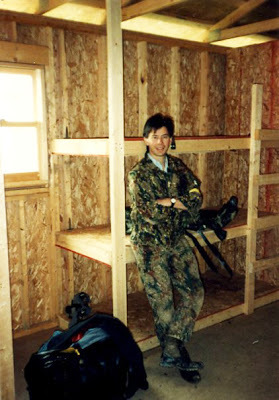 It was an overnight trip and we got a bit of a shock when they dropped us off at our “barracks.” There was nothing to sleep on except rows of bare particle board bunks. We hadn’t known to bring sleeping bags! So we spent a cold night trying to get some sleep in the unheated structure. In other words, not much sleep. Another trip we went to West Point to battle the cadets. First time out I think they beat us, but once we caught on to their unusual, but predictable fighting style, the second time out we beat ‘em. We often had chaos and unpredictability on our side. Carl Potts and the Spartan accommodations at Wolf’s Lair. I also found out an odd thing about myself. If I tried to aim carefully I could pop away all day at a guy and almost never hit him, but if someone became a moving target, they were dead! For some reason, adrenaline maybe(? ), I can pick off moving targets like crazy. I was pretty slim in those days and could hide in small spaces so I tried some Jack Morelli sniper action myself a few times. JayJay Jackson, Bob Sharon, Dan Raspler, ?, Steve Buccellato, ?, Don Daley, Carl Potts, John Wellington and a mysterious masked player. Carl Potts in his amazing Spanish Foreign Legion paratrooper camo that made him invisible! I've seen the video you're talking about and I don't see why Stan's comments offend you. I should clarify that I started out as a fan of Liefeld but the way he treats people online disappointed me so much that I no longer admire him at all. If that Stabur Home Video makes anyone look bad, it's Rob as far as I'm concerned. The moment where Cross is created portrays Rob as very hypocritical. Even though the character incorporates Stan's suggestions, Liefeld refuses to acknowledge Lee as a co-creator. Every time Stan implies he's helping, Rob has the nerve to say "Have your lawyers call mine." I'm pretty sure none of the Youngblood and Berzerkers comics starring Cross contain a credit towards Stan Lee. There is definitely grounds for an appeal. Specifically, what is creation, and has it been properly compensated? To me, Jack Kirby co-created what became Marvel Entertainment, along with Steve Ditko and Stan Lee. I read the ruling, and while Stan may believe "everything" was at his instigation, I believe Marvel Entertainment would not exist without Jack Kirby and Steve Ditko. They were the spark. Now, as I wasn't there, my word is nothing. About the only guy who could really add something to the case is Steve Ditko, and there's no telling what could motivate him to be deposed. That said, the argument should be that getting a page rate for a comic book is no compensation for the ideas that spark a billion dollar industry. It's just plain wrong. I love Jack Kirby and most of his work even into the 1970s, but it's plain to see that his heirs can't inherit copyrights he never owned. He created Marvel characters under the same agreement as everyone else at the time. Steve Ditko understands this. Even the King isn't above the law. Even after I left staff at Marvel (and even in the beginning when we started VALIANT) I still played paintball and went on the Marvel ski trips and stuff, but once we got so behind at VALIANT I stopped outside activities and just concentrated on work. When I was fired from VALIANT I tried to start up my own ad agency so there was no time (or money) for fun stuff and then we started Defiant, etcetera, etcetera. Working in "start-ups" will change your life. …On a side note, thanks go to Rich Johnston over on Bleeding Cool for scrounging up about half of those links. Jim, you may very well be! But, I respect your work and my hat's off to you, sir. I was aware that the Kirby estate was suing Marvel. This is the first I've heard of an outcome. Marvel's attorney called me some time ago to warn me that I was being subpoenaed by Kirby's lawyers and that I would be deposed. They, Marvel's law firm, accepted service on my behalf. That was the last I heard of it. I wasn't deposed, I didn't testify and I don't know much about it, other than what I've stated here in posts. I'm not familiar with the video. Sorry. I thought I was the biggest pariah. …And I suppose Matt will agree with me that this might be the time for Jim to address the recent decision in the courts against the Kirby heirs. General consensus in the various forums – forii? – is split between either the judge had no choice but to rule against the Kirbys due to all the evidence against Marvel being "circumstantial", and that the judge was a clueless fracktard and/or Disney/Marvel bought him off, "probably with all that stolen Kirby art Marvel kept hidden in the breakroom!" …So, *can* you comment on the case and the ruling, now that it appears to be a done deal? Correct me if I'm wrong, but ICSTR that you were called in to testify on this one, for that matter. I don't know what this "Comic Book Greats" video is, but Stan Lee was barely involved with Marvel by the time Rob Liefeld got there. Certainly not editorially in any way. On a completely different subject…Mr. Shooter, in spite of all the great and creative things Stan Lee did for comics, would you agree that he took advantage of a young and naive Rob Liefield to reach an audience? I am in no way defending his poor work, but I've realized that he was given the go ahead from editors. Watching Stan Lee pimp out the 22 yr old kid on that little "Comic Book Greats" video makes me sick. He was young, good looking, and his image said to kids, "Look, you can be a comic book superstar, too!" Believe me, I can't stand Liefield's work, but Stan Lee set him up to become the biggest pariah in the industry. Do you still play today? I played once years ago and fell so in love with paint ball that I bought a gun and kit the same night. Haven't used it since. But effendi, I am not this 'Marvel' you speak of! SHADDAP AND DIE, PUNISHER SCUM!! Defeating the West Point cadets must have been a real trophy for the Punishers. Chapeau! Wow, you guys were intense back in the day. Enough to justify a comic about the team: The Punishers. The tie-in value of the name alone would guarantee sales — at least for the first issue! A West Point crossover and a rematch? Whoda thunk it?